If you have unlimited resources, by all means, buy whatever you like at Anthropologie. However, most of us with more limited budgets need to pick and choose how we spend our pennies at this lovely store. If you want to get the Anthropologie look for less, it’s best to buy some of Anthro’s signature pieces and avoid what I consider their filler items. When you are physically at the store, you can lose your head and begin to want EVERYTHING. Stop and consider that certain items are not at all magical and unworthy of the Anthro high price tag or probably even slightly lower sale prices. 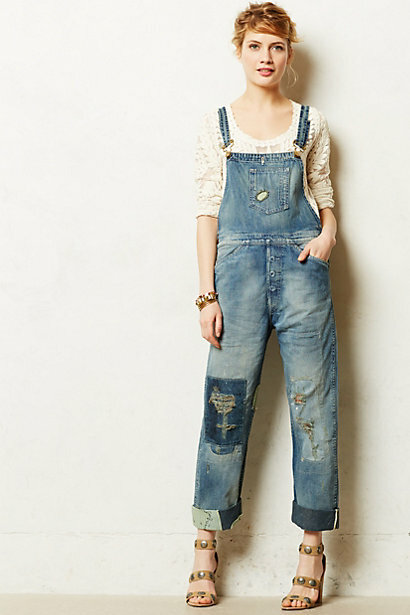 So maybe they’re making a comeback, but I haven’t seen anyone wear overalls for a decade. I’m not willing to spend $475 on these, are you? 1. Jeans. I am well aware that a pair of jeans that fits you well is worth its weight in gold. If nothing fits you like Anthro jeans and you got them on some super clearance, then MAYBE it’s worth it, but otherwise don’t buy jeans here. They run from $98 to a whopping $475 a pair, averaging out at about $200. If you take off the Anthro goggles, you see they are just your basic selection of skinny, bootcut, wideleg, crops, cuffed, preripped, etc. I promise you can find jeans you’ll like for less pretty much anywhere. Which pants are from Anthro and which are from Gap? If you can’t tell, I’m not telling. The only difference I see is the $178 difference in price. 2. At least half of their pants. Much like their jeans, most of Anthro’s chinos, trousers, cargos, and joggers are not that different from what is offered at your neighborhood department store or Gap. What are distinct are their patterned wide leg pants and silk trousers that look like they came from some far off bazaar. If you are going to buy pants you can’t find somewhere else cheaper, get those. Remember, you’re looking for something distinct. These lace shorts are something I haven’t seen someplace else. 3. Half of their shorts. Are you sensing a pattern? If it goes on the bottom half of your body, take a moment and really look at them. Are they a basic colored cotton or denim short? Did they do anything interesting with them like add a scalloped lace edge that makes them uniquely Anthro? If not, please don’t pay $178 for them. 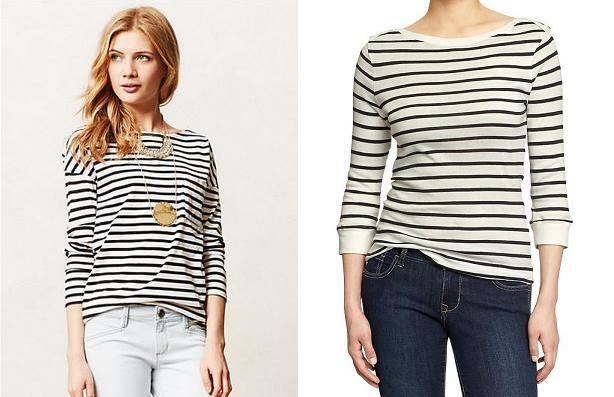 Yes, the Anthro picture looks more glamorous, but their shirt is still a cotton, black and white striped 3/4 sleeve tee, which makes it awfully similar to this Old Navy one in my book. 4. Basic tees and tanks. In general, tops are where you get your money’s worth at Anthropologie. However, lurking amidst the lacy confections and silks that look like watercolors are solid color v-neck tees and striped long sleeve shirts. Do not pay $78 for that nonsense. Go to Old Navy and pay $10. you bring up some great points !! i love to do my shopping at anthro for their quality & return policy : ) i feel it’s worth spending the extra to know my item will last & it comes with a guarantee ! i’ve always found anything i buy from gap, xxi, or h&m always fall apart after a few washes whereas the majority of my anthro clothing has weathered the storm (and terrible laundry machines haha) . A good return policy and good quality are always something to consider; you’re absolutely right. There are definitely times I’ve paid more for a quality item or bought something at a store just because I knew they had a great return policy. However, I’ve been buying Old Navy and Gap for years, and I haven’t had the fall apart after a few washes problem. I have a few shirts from ON I’ve been wearing and washing regularly for over nine years. Occasionally, I have had an item or two that did get a hole or something faster than I would have liked, but when it cost me $10, I haven’t worried too much about it. My point is just consider whether something is worth a $178 price difference even if the quality is slightly better. I buy Anthro clothes, but I make sure what I buy is unique, distinct, and the craftmanship feels more equal to the price tag. When there’s a lot of detail work on it and made of a more expensive fabric, I can understand a higher price. I’m never going to understand $200 khakis or a $80 cotton t-shirt.